On my way to the land of hobbits, sheep, mountainous landscape and volcanic activity, I realised I didn’t really know much else about our friendly neighbours in New Zealand. I certainly had no clue about the food culture over there, and safely assumed the country had some kind of ancient proverb that went a little along the lines of: “A kiwi fruit a day keeps the doctor away”. 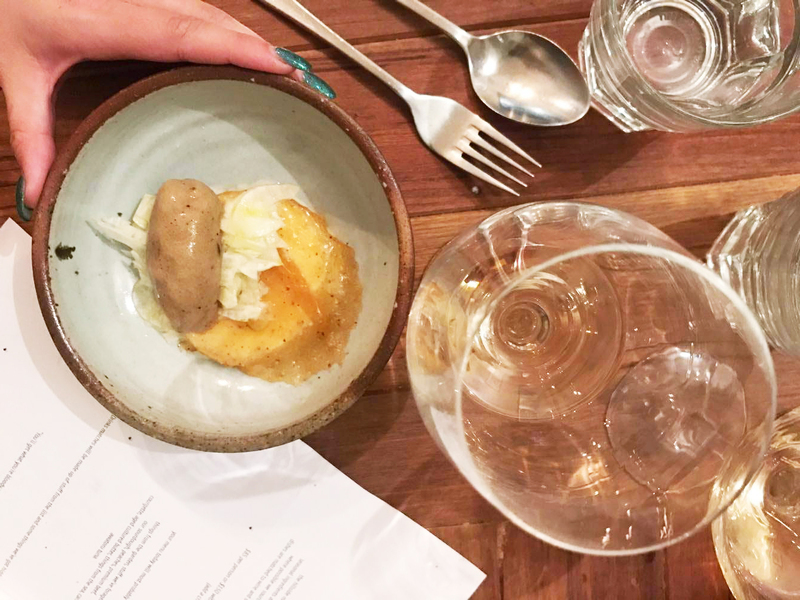 In an effort to truly immerse myself in New Zealand’s contemporary culinary scene during my travels, I sought out a quaint little restaurant called Hillside Kitchen and Cellar. I hoped the restaurant would open my eyes to what’s hot and happening with NZ eats (and maybe teach a bit about local produce aside from the kiwi fruit). Located in the country’s capital city, Wellington, Hillside pulled together fresh ingredients from local hotspots all around the region. 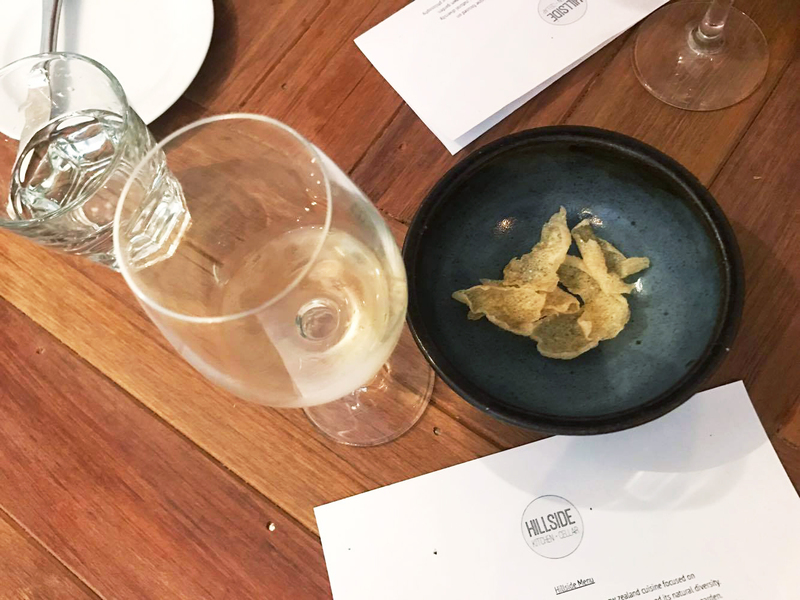 Alongside a menu rich in complexity and a strong organic ethos, Hillside also offered an extensive wine list including some of the country’s finest. 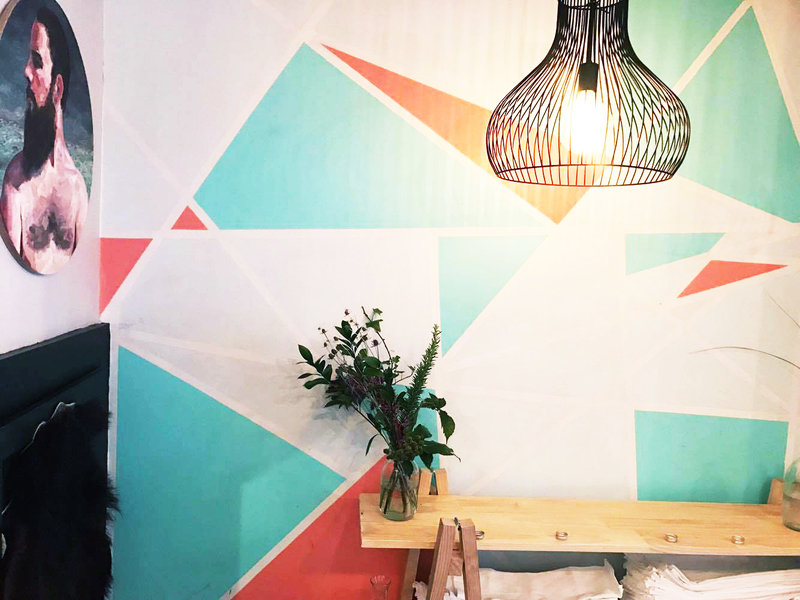 Stepping into the cosy, rustic space, I was immediately taken back to our time at The Summertown Aristologist in the Adelaide Hills not all that long ago. The fitout was very similar with the wooden tables, open kitchen space and quirky décor. 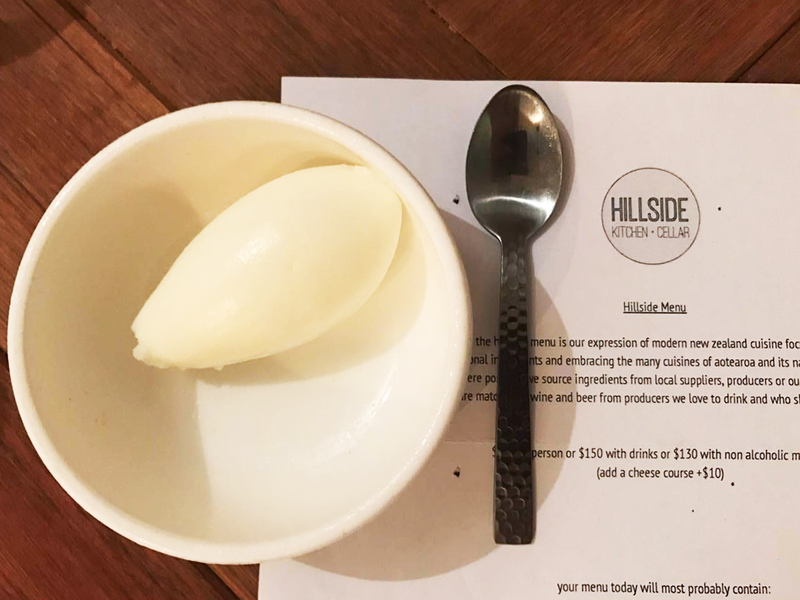 Hillside also bore the same ideologies as Summertown Aristologist, aiming to serve only the freshest and most organically produced ingredients sourced locally. 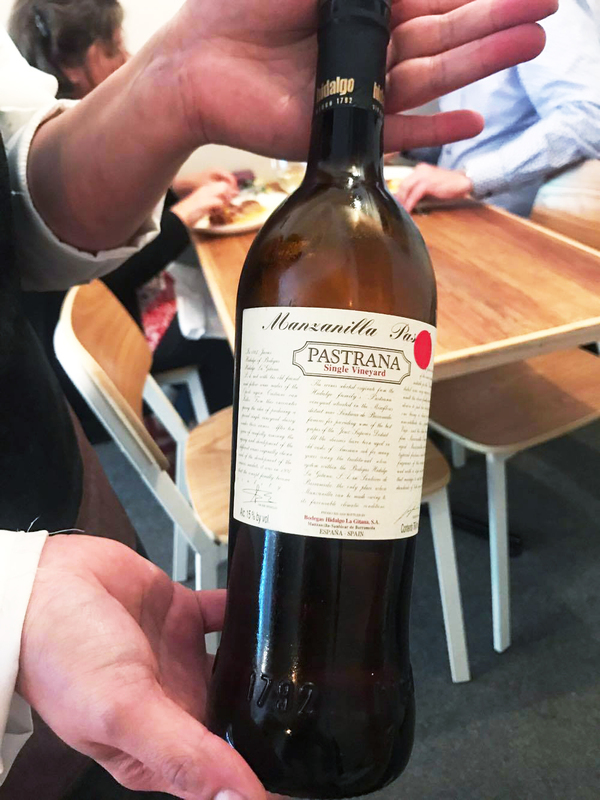 This came right down to the kind of wine being served, offering various natural and biodynamical grown wines. The degustation style was also quite similar; we were not told about the dishes or wines we would be having on the night, rather, Head Chef Asher would choose what we were to be served according to the ingredients freshest in produce on that very day, with the wines paired accordingly. The experience was very personable having Asher himself come out to explain each course in great detail. 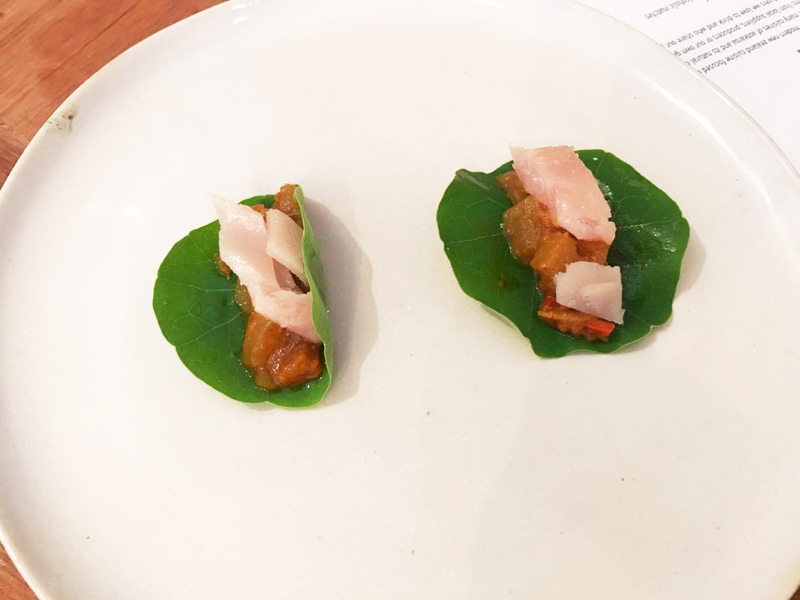 Our first few courses were chronologically the Fried Rice Chips, Nasteisha Taco, Homegrown Ham and Sourdough and Butter dishes. The rice chips melted elegantly in my mouth, as did the tangy taco complete with fresh local tuna wrapped in a Nasteisha leaf (which I’m pretty sure I’m spelling wrong). 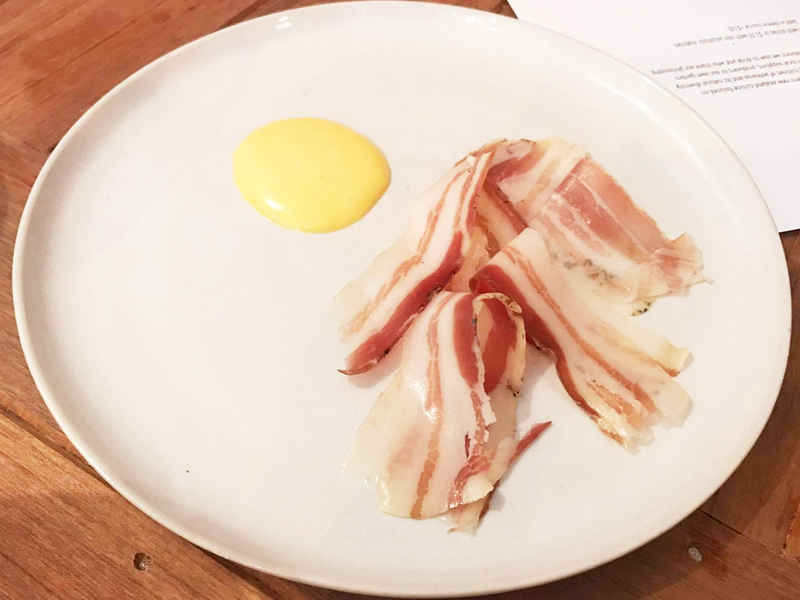 The third dish, Homegrown Ham, had been aged for 6 months and came from only the happiest of farmed piggies according to Asher! 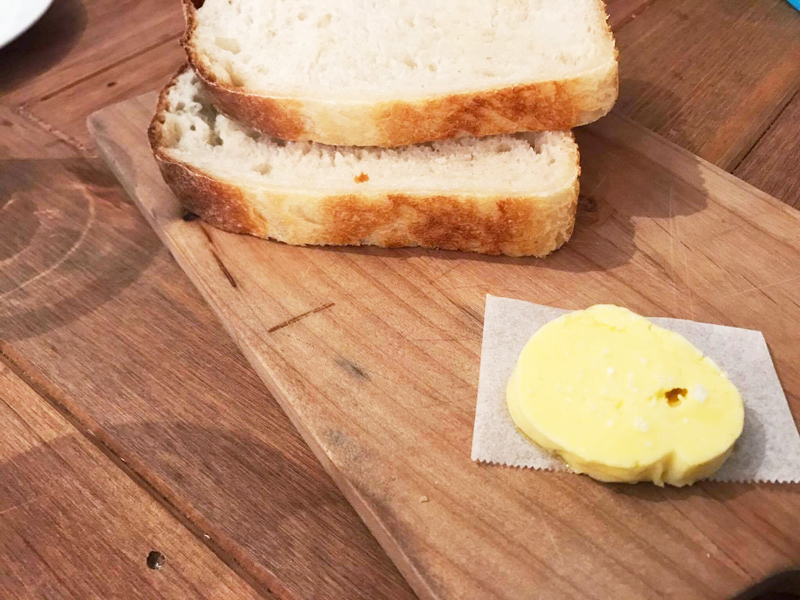 It may sound boring, but the bread and butter was my favourite of the four, purely due to the unique butter that Asher and his team had aged in-house. We were told they were trying a different style of making butter, pushing the aging to a lengthy two month period which was what gave this creamy butter its incredible blue cheese flavour (as an absolute die-hard cheese fanatic, how could this not be my favourite). These dishes were paired with an intense Pastrana Single Vineyard from Spain. Next came a healthy Garden Salad, which Asher informed us was made up using vegetables plucked from the restaurant’s very own garden at around 3pm that same day. 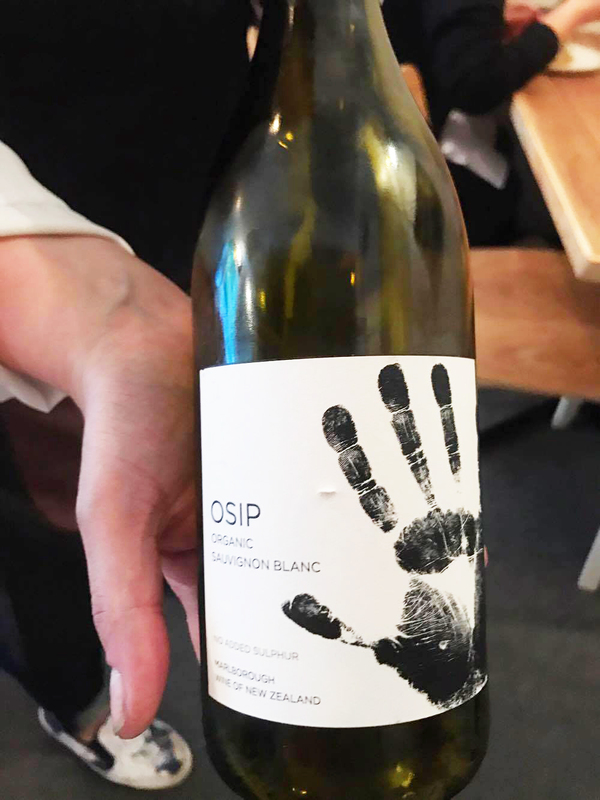 Alongside the salad came paired an OSIP Savignon Blanc, which had initial hints of poached pear on the nose and a tasteful passionfruit flavour profile. The most beautifully presented dish was a seafood course of Crayfish Broth and Clams. 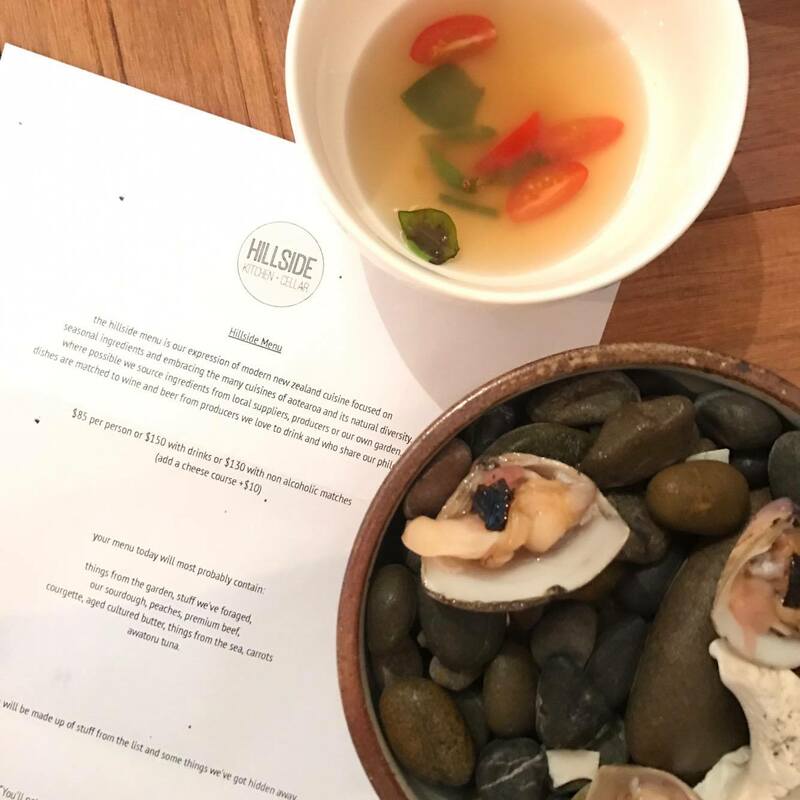 Three flavoursome clams came served upon a bowl of round pebbles from the seaside, with the broth served in a separate bowl of its own. The clam meat burst of sea-flavour, accompanied by a firm and chewy texture which made for a delightful experience. However, my only issue was trying the clams before the broth; the broth had only a very subtle crayfish flavour which was almost completely overpowered by the oceanic flavours of the clam. 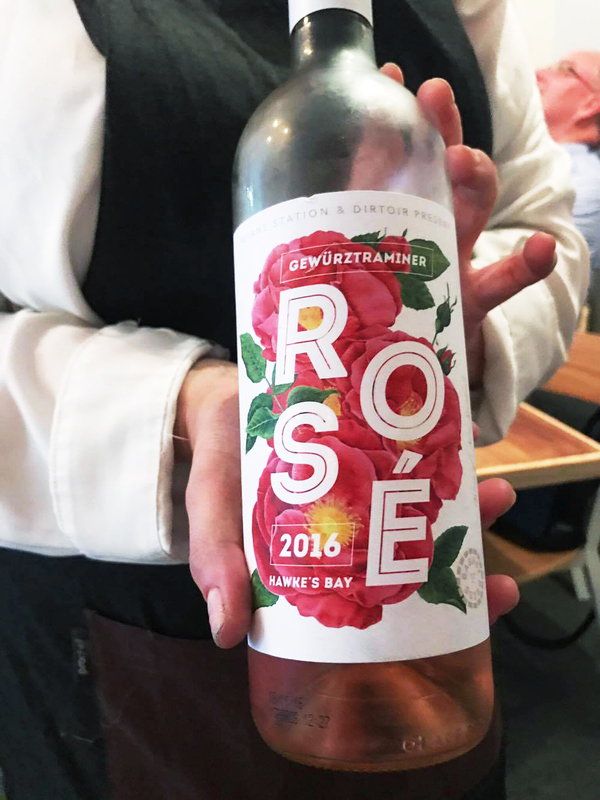 The somewhat sour yet elegant OSIP 2016 Rose paired delightfully with this course. 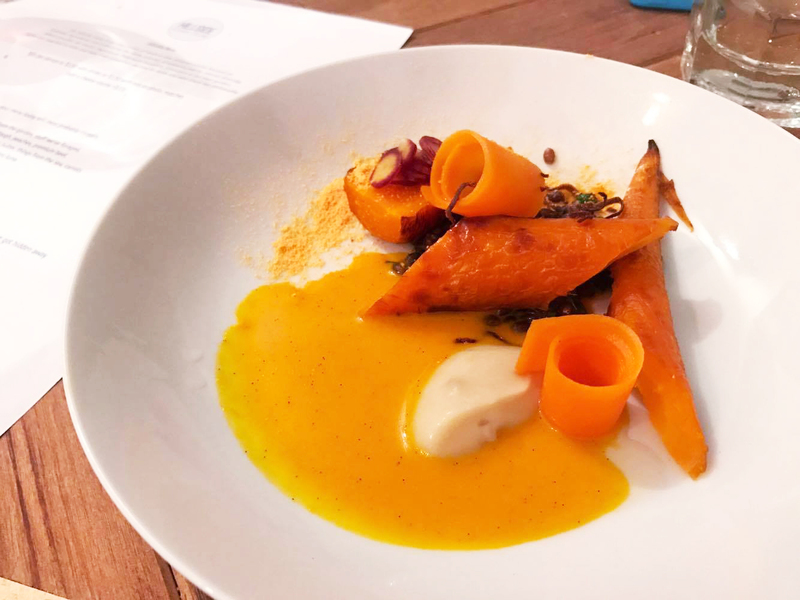 Next came the most colourful dish of the lot: a Coffee-roasted Carrot dish. Bright orange in colour, this carrot and coffee combo was downright delicious, complimented by a tasty garlic puree to break up the strong flavours. It was quite sweet (could almost be served as a dessert) and I was super surprised how very well coffee compliments carrot! We downed this dish whilst sipping on a glass of OSIP 2015 Pinot Noir. 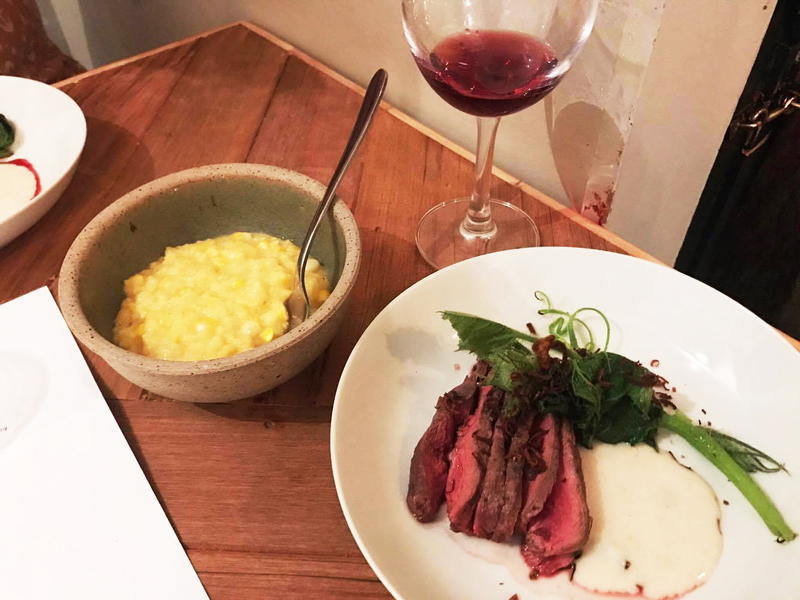 Our 8th dish was a Flat Iron Steak sliced thinly and cooked rare, served alongsite sweet corn mash and a horse radish puree. Asher explained to us in detail how the steak cut comes from the bottom of the shoulder and is a meaty, very lean cut that is sometimes a little tough but incredibly flavoursome at the same time. 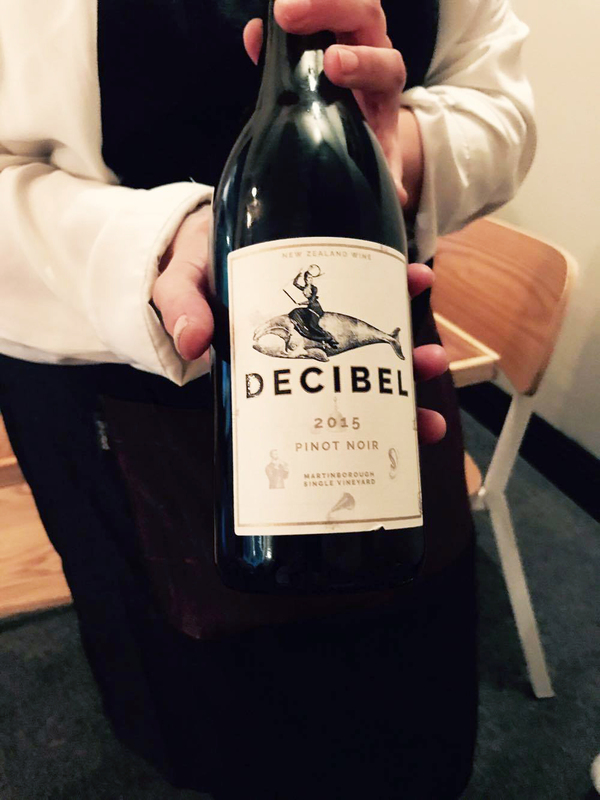 Fittingly, we moved onto the Decibel 2015 Pinot Noir, giving us the chance to compare and contrast with OSIP’s Pinot from the previous course. 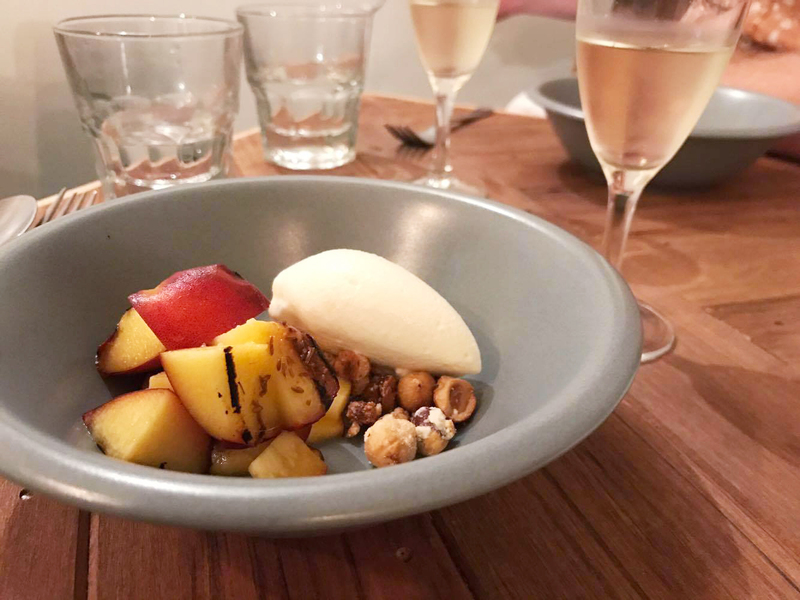 After a cow’s milk sorbet palate cleanser, dessert came in trois: a Stracchino Cheese dish, Warm Peaches and a taste of Meringue, Burnt Caramel and Marshmallow. 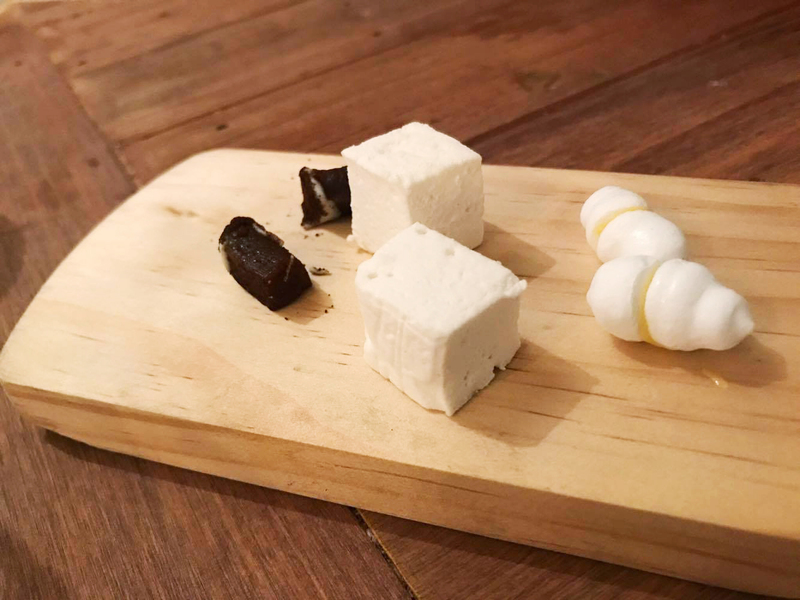 Our favourite of the few (and professed favourite out of all dishes on the menu for my fellow degustee) was the cheese course, served in a surprisingly unconventional way. The warm dish offered a toffee-like exterior with a unique, soft cream cheese interior, merging sweet and savoury seamlessly together. A side of cold pear ice cream contrasted the warm cheesecake, which added to the textural elements of the toffee crunch and the velvet cheese. The complexity of this dish truly won our hearts. Alongside dessert, we sipped on a Late Harvest Pinot Gris and a Cambridge Road 2016 Papillion Blanc. Regards to chef Asher and our waitress Daniella for giving 10/10 customer service; we will be back next time we visit NZ!